One of the simplest ways to store food is in the freezer. You can freeze just about anything – fruits, veggies, herbs, meat, jelly, baked goods – with little equipment save a freezer and some plastic bags or other containers. 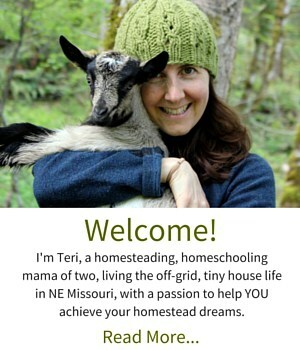 This week I had the opportunity to buy 20# of fresh green beans from a local farmer. While I saved some for fresh eating, and made a small batch of lactofermented dilly beans, the rest of the green beans were frozen. 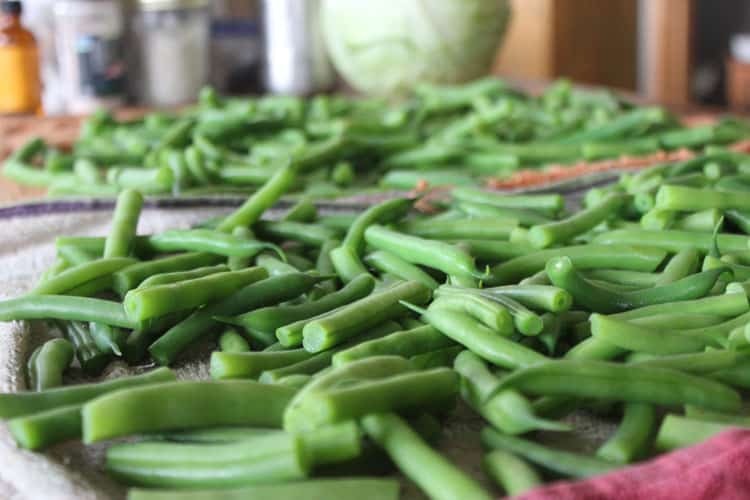 This post will show you how to blanche and freeze green beans so you can enjoy them all winter long! Should I Blanche Green Beans Before Freezing? Almost all vegetables should be blanched before freezing. 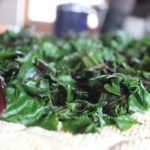 Blanching stops enzymatic activity which can cause loss of flavor, nutrients, and color. From the chart you can see that green beans require only three minutes of blanching, so the process is very quick. 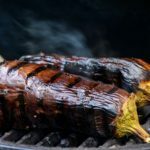 Some preservation resources recommend saving time by forgoing the blanching process, but my experience has been that when I do not blanche green beans, the flavor, texture, and quality of the preserved beans is greatly compromised. In my opinion, it’s worth taking a few extra minutes to blanch green beans before freezing. What Equipment Do I Need to Freeze Green Beans? Now for the nitty gritty of the freezing process. Before starting to preserve your fresh green beans, be sure to have all of your supplies at the ready and a pot of water heating to boil. 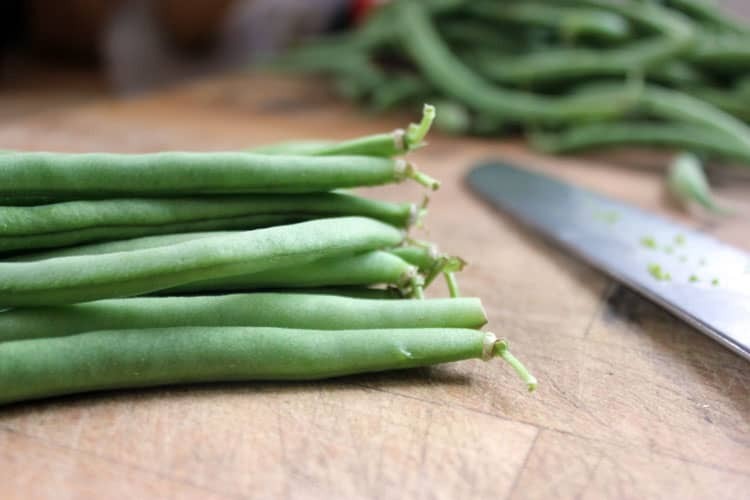 1) Prepare green beans by trimming off the stem ends and cutting the beans into halves or thirds. 2) Place cut green beans into the strainer of your “pasta pot” and plunge it into boiling water. Set a timer for three minutes and allow the beans to blanche. 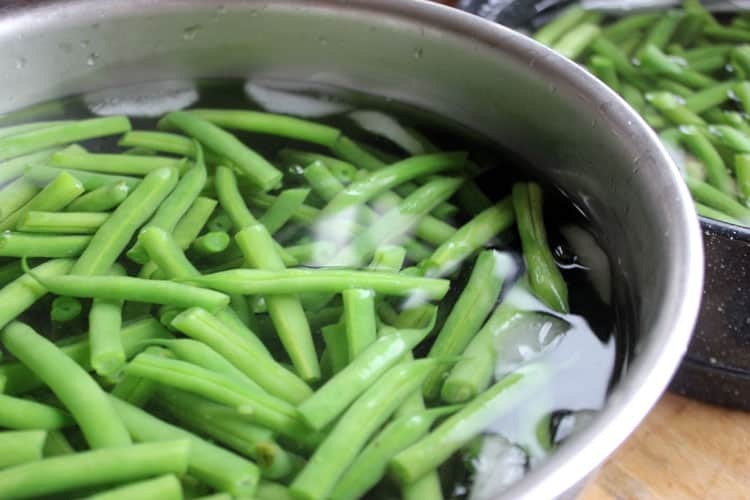 3) Remove the green beans from the boiling water and immediately place them into bowls of ice water to quickly cool. 4) Once the beans have cooled, place them on towels to dry. 5) Package the beans into your freezer containers and label them for storage! If you prefer to learn by watching a video, this will show you exactly how to blanche and freeze your fresh green beans! 1) Label bags or containers with the item and date frozen with a permanent marker such as a Sharpie. 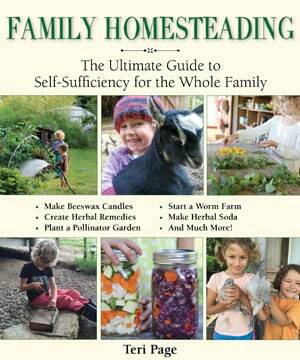 2) Eat within a few months. Frozen food can get freezer burn or develop off flavors from remaining in the freezer too long. 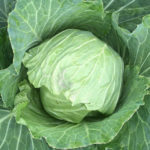 Fruits and vegetables are generally considered safe to freeze for 8-12 months. 3) If you plan to store items in a chest freezer, you might want to document what you’ve placed on the bottom so items don’t get forgotten! Vegetable hummus – add a cup of thawed green beans to your regular hummus recipe for a bright green treat! 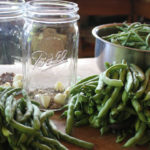 If you are interested in other techniques, this post describes three other ways to preserve green beans, including canning, dehydrating, and fermenting. 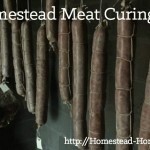 You’ll love these food preservation posts too!